The margins of the creek are just beginning to crust over with ice. Some of the ponds between home and work are showing a thin glaze of ice in patches on the surface. I’m thinking maybe next week will be the first week of the current Ice Images season. 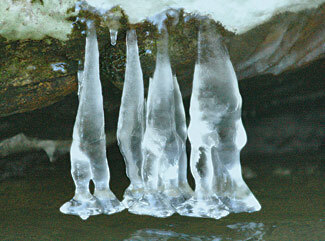 This one I call Ice Gnomes from a few years back, was taken during January after a couple of freeze-thaw cycles. Wish I had more time but duty calls. They look like Ice Bats.